At any given moment, you can start logging times (per project, per user etc.) from the “Time” menu. Manually, by clicking on Log time. 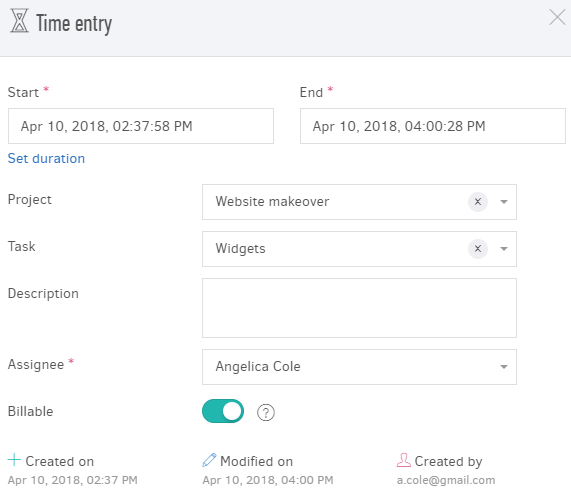 > Users with the role of time tracking manager can create time records for other users and view time records for all users. For more information, visit the related article. If you or a team member work on a task/project but haven't finished yet, you can use the time entry bar found at the top of the page. As soon as you click it, the system begins to recording your time and displays a bar from which you can either select a project, a task, or both, to which the time entry refers. Clicking on X, the bar folds back at the top of the screen so it doesn't take up your screen's space. Once you have finished working, you can tap the Stop icon and Elorus will create a new time entry that be found in the time entries list. When you finish your task, you can press the Stop button and a time entry will be automatically. By clicking on Log time you can create a record with specific start date / time along with an end date / time. Set exact start / end dates as you can see in the image above. Or set a duration in hours by clicking the relevant field below the start field. The assignee: You can select another user (if you have that kind of permission) or yourself. Whether it is billable: Applicable only when a project is selected. > Designating an end date here is mandatory, so if you want to keep track of an ongoing task/project you can use the timer bar at the top of the page. 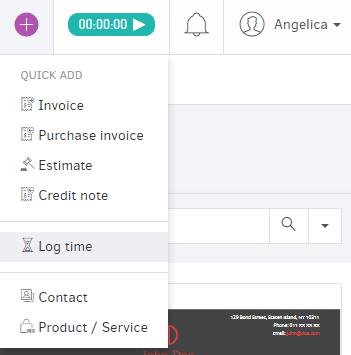 You can also track time manually by using the Quick Add menu on the top-right of your Εlorus account. With Elorus you can also track your time directly from third party applications, via integrations.